Please remember that this is the last week to register for your hotel rooms. Either call 617-567-5000 or click here. Attention students: If you are planning to stay in the hotel, please contact me to arrange for your stay, as we pay for student rooms as long as you agree to room with other students. If you have trouble or need assistance, call Amy Ruell at 781-267-4432 or send email to aruell@comcast.net. You may find the NFBMA 2019 convention agenda on this page; simply scroll to the bottom or search for docx. 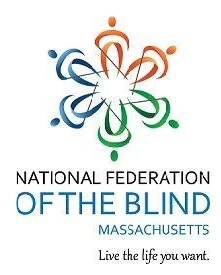 The National Federation of the Blind of Massachusetts strongly opposes any efforts to consolidate the Massachusetts Commission for the Blind with any other agencies; read the resolution here. The National Federation of the Blind of Massachusetts has thriving chapters in Cambridge (metro Boston) and Springfield, and members from across the state. We have a vibrant group of blind students who attend high schools and colleges, both private and public. We are parents, teachers, lawyers, social workers, entrepreneurs and many other successful people--who just happen to be blind. We all work together to support each other and improve the lives of blind people all over the commonwealth. We hope to see you at one of our events soon! Website designed and managed by tyler Littlefield.